The short version of Vilhelms Purvītis’ biography mirrors brightly the history of Latvian state. It is typical to many talented Latvian artists. He was a self-made man who set out to conquer St. Petersburg and together with his like-minded contemporaries returned to Riga. 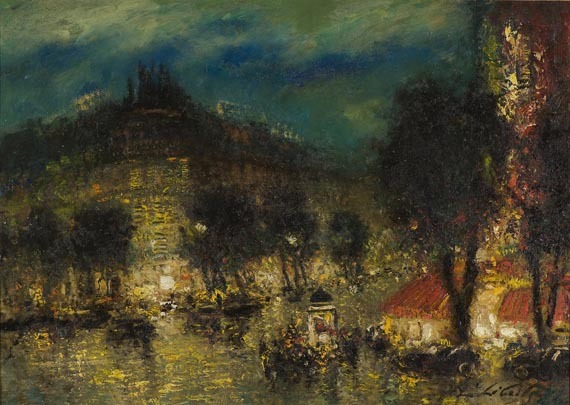 Vilhelms Purvītis (1872-1945), a landscapist adored in Latvia and well-known abroad, has managed to achieve the impossible. 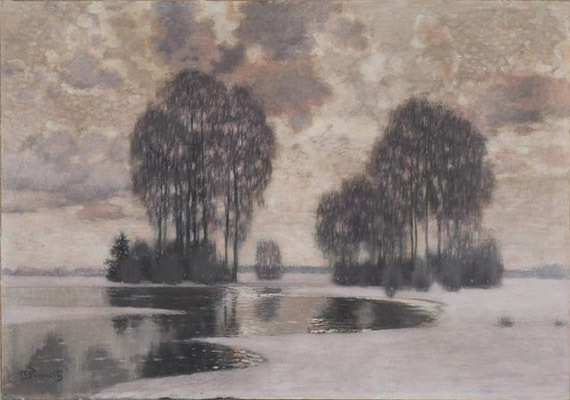 His landscapes of Latvia with melting snows and spring floods have become the image of Latvia in Latvians’ minds. His organizer’s talent, creating new art institutions for the newly founded state, has not been surpassed till the present. Purvītis returned to Latvia, having received education and elected Academician of St. Petersburg Academy of Art; then he founded Latvian Academy of Art in Riga (1919) and was the Rector of the Academy (1922-1934). Also, he restructured the Riga City Art Museum into the museum of Latvian national art and gathered a splendid art collection that serves as the basis for the exposition of Classical Modernism (1920s – 1930s) at the Latvian National Museum of Art. He was the editor of the first general art-historical survey in three volumes, published in Latvian. Purvītis was the commissioner of Latvian art exhibitions abroad up to 1939, organising exhibitions in Budapest, Vienna, Prague, Paris, London, etc. It would be no exaggeration to say that Purvītis was a whole institution himself. His talent has been recognised many times at international exhibitions. His works have always been wanted by collectors and he is one of the very few Latvian artists whose art is in the range of interests of large international auctions. Purvītis headed Riga City Art School up to 1915; many of the later avant-garde stars acquired their first education in art there, including Gustavs Klucis, Voldemārs Matvejs (known in Russia as Vladimir Markov), Kārlis Johansons and many others. During W W I many of them ended up in St. Petersburg, Moscow, Penza, Kazan and other Russian art centres where they had a chance to continue their education and establish contacts with the creators of Russian avant-garde. In the 1920s some artists made friends with French Cubists and circles around the journal “L’Esprit Nouveau” and published articles on Latvian art. Latvian artists established also contacts in Berlin; they exhibited with the November Group (Novembergruppe) at the Great Berlin Art Exhibition. The Bolshevik revolution in Russia and results of W W I enabled to found an independent Republic of Latvia in 1918. RIGA ARTISTS’ GROUP established in 1920 had an especial role in the development of modern art and united many talented artists – Oto Skulme, Marta Skulme, Uga Skulme, Romans Suta, Aleksandra Beļcova, Konrāds Ubāns, Valdemārs Tone, Eduards Lindbergs, Ludolfs Liberts, etc. This association dreamt about the development of modern, contemporary art in Latvia. In their practice they developed various artistic trends from Expressionism to Cubism, creating an original local school. Fascinated by the radical avant-gardes of revolutionary Russia, the founder of photomontage Gustavs Klucis (1895-1938) and abstractionist Aleksandrs Drēviņš (1889-1938) decided to stay in Russia; their personal motives were also important as both were married to the amazons of Russian avant-garde – Valentina Kulagina and Nadezhda Udaltsova respectively. In the inter-war period Latvian intellectuals – doctors, lawyers as well as contractors etc., were active art collectors. The mansion of the Latvian press king Antons and Emīlija Benjamiņš in the centre of Riga was decorated with many Latvian artists’ works, family portraits, especially commissioned stained glass, etc. Active art collectors were also among the Opera soloists, stars of ballet and exotic dances who bought Latvian artists’ works as well as purchased works from various exhibitions, travelling around Europe. Doctors Aleksandrs Neibergs (1875-1950) and Krišjānis Katlaps (1892-1964) gathered large and valuable collections. Both carefully selected works in artists’ studios, following the development of their careers. Part of Neibergs’ art collection now makes up exposition highlights of Latvian National Museum of Art. Katlaps’ collection now partly shapes the core of Tukums Museum. Events of W W II forced many artists to flee into exile, including Vilhelms Purvītis. Part of the large collection owners also emigrated. Some managed to bring part of their collections to their new homelands. As the Soviet power took root, properties of wealthy citizens, including art collections, were confiscated and nationalised. Many valuables perished in the war-time turmoil.